As the new year beckons many people will be thinking about their goals for 2018 and they might be making new year's resolutions. In today's episode of The School Success Formula I wanted to talk about my experience of how to make a success of your goals and resolutions so that you and your children can achieve the things you want to achieve in 2018. Giving up chocolate for a year! At the beginning of 2001 I made the resolution to give up chocolate for the year. At the time I was at university and at about eleven o'clock every morning I would get hungry. I would usually be in the geography department library at this time and the only source of food there was the chocolate machine in the basement. It was also a little bit social as several people would go down to the chocolate machine at the same time. I dropped into the habit of eating chocolate pretty much every day. I realised what I was doing. Not only was it relatively expensive, it was also unhealthy. So, I decided to give up chocolate for a whole year. What I did to make this successful was that I went to Sainsbury's once per week to buy a bag of apples so that I had an apple to take with me everyday, and I could still go and chat to the other students when they went to the chocolate machine, but I would be eating my apple. Another new year's resolution I made was to learn to like fish. Throughout the early part of my life I hated fish, but I knew it was healthy and it would be good for me to eat more of it. So, I set myself the goal of eating fish once per week for the whole year. To start with, I cooked the fish in strong curry sauces so that I could barely taste it, but by the end of the year I was eating fish without any other flavours to disguise it – and I was actually enjoying it! I've maintained the habit of eating fish about once per week ever since – and it's been over ten years. What can you learn from these successes? Now, don't get me wrong. I've made many more new year's resolutions that have failed than ones that have succeeded, but I wanted to give you an insight into why the two resolutions I've told you about worked. Many people make new year's resolutions like ‘I'm going to lose some weight' or ‘I'm going to study more'. The problem with these resolutions is that you don't know when you've achieved success and there is no imperative to do something about it today, or keep doing something about it every single day for the rest of the year. With the chocolate resolution I knew that I would have achieved success if I hadn't eaten any chocolate for an entire year (in the event I kept it going for 15 months). It was really easy for me to measure my success. Your success needs to be specific and measurable. Find out more about how to create habits that work for you in this blog post, which is based around Gretchen Rubin's book, Better Than Before. With the chocolate resolution I knew that I wouldn't be able to keep it if I didn't replace the chocolate with something – otherwise I'd be hungry and miserable (and no-one wants to know me when I'm like that). So, I made the plan to buy the apples every week and that sustained my resolution. With the fish resolution my plan was to repeatedly expose myself to the taste of fish by eating it every week until I learned to like it. I created a weekly menu every week and every week I had to include one fish dish. My husband and I would go shopping at the weekend and make sure we'd bought the ingredients for the fish dish. Do new year's resolutions need to be specific? c) how they were going to make that happen. I'd then work with them to create a weekly routine and keep them accountable to it. However, I think you can frame your new year goals in a different way if they are more of an intention than a goal. I first came across the idea of having a ‘word of the year' rather than a new year's resolution from my artist friend in New York, Miriam Schulman. A few years back she said that her word of the year was ‘harmony' and that she intended everything she did – both work and family wise – to resonate with the idea of her life becoming more harmonious. I really loved that idea but didn't take it on board myself until last year. In 2017 I set my intention for the year to be ‘growth'. I wanted to achieve personal growth in many different ways, as well as to grow my business. In some ways this could be measured – by the number of email subscribers I have or the amount of money that I make. But in other ways it was a subjective thing. I can definitely say that I have grown in very many ways over the course of 2017 and it's because I've had this intention underlying everything I do this year. For 2018 my word of the year is ‘Go Pro' (well, it's more like two words, but you get the idea). Up until this year I haven't had 100% confidence that my business could become the kind of success that I wanted it to be. This year I've proven to myself that it can be. This means that I want to formalise the systems and processes behind the scenes that I've been less professional about over the previous years. I no longer see myself as a stay at home mum having a go at this – it's for real and I want everything about it to be professional, not just the surface, customer facing aspects. Do you think that a word of the year could work for you or your child? You may remember that back in episode 21 of the podcast I interviewed Shola Alabi about how she'd used goal setting to help her family move forwards. I took the ideas that she shared and over the last half-term of 2017 I've been using them very successfully in my family. My husband and I had both noticed that my five year old son's handwriting wasn't great because he didn't know the correct letter formation for most letters. We set him a goal of practicing a letter everyday. It has been absolutely transformational for his writing. We finished all the small letters, all the numbers and all the capital letters by Christmas and his writing is now better than many grown-ups. The icing on the cake was a teacher from another school visiting and saying that she'd never seen such good writing from a five year old boy. My daughter has been learning the piano for about two years now. She practiced relatively often but it was a bit hit and miss. We set her the target of practicing for ten minutes every single day. She missed one day because she was off school with a high temperature – but she's done it uncomplainingly every other day. Her piano teacher can't praise her enough for the progress she has made and it's all down to her consistent hard work. At the same time my husband and I have had goals. I've been watching a TED talk every day to pursue my dream of doing one myself. Even on days when I get to bedtime and realise I haven't done it, I find a short one to watch so that I don't let the children down. My husband has been maintaining his goal of running three times per week (even though he had to take a break because of the snow). Working together as a family in this way has worked spectacularly well in keeping all of us accountable. We're all working towards specific goals specially chosen for our needs, but because we are all doing it we feel the need to maintain our good habits. If your child needs to work on something specific, get more consistent or form some good habits I'd highly recommend setting family goals in this way as a way to move forward in 2018. If you feel that you'd like my support with setting goals, creating good habits and working together as a family then please consider joining The Exam Success Formula, my study skills course for students and parents. It's so much more than a course simply about study skills – it's about creating good habits, knowing what you're working towards and why and communicating more effectively as a family. The course starts on 20th January and registrations close on 19th January at 9pm – but I'd highly recommend signing up beforehand as there's a bonus module that's available to you from the day after sign-up all about getting organised. 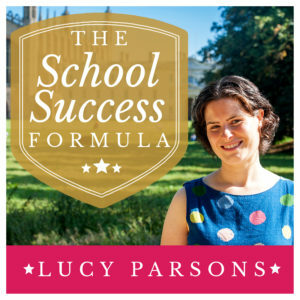 This episode marks the six-month birthday of this podcast, The School Success Formula. To celebrate I’m giving away three signed copies of my book, The Ten Step Guide to Acing Every Exam You Ever Take. To win a copy leave a review of the podcast before midnight on 3rd January 2018. I will pick the three winners on 4th January and announce them on the podcast episode on 10th January 2018. You will need to contact me with your postal address to receive your copy of the book. If you already have a copy you might like to give that copy to your child’s school library or to a friend so that you can keep the signed copy. Click here to find out how to leave a review in iTunes on your desktop. Scroll down the screen to where it says ‘Ratings and Reviews’. Give your review a title then write your review – tell the world what you like about the podcast and how you’ve found it useful.